How can someone put more than 3000 years of cultural and musical development in the sum of, maybe, twenty words? And how can we afford to reach out to a tradition that is so huge and rich and divers like the Chinese without loosing respect when we leave out details and try to summarize? There are many articles trying to introduce into the Chinese music, its musical forms and history, so I would like to do something else: We always get astonished about the age of Chinese culture. And, even if we know little to nothing about the mythological “golden age” of early China, we still find many items and habits that survived until today, which also still represent the "essence" of Chinse music. This article tries to go back into these ancient times and ask for the first appearance of the musical instruments which are still alive today or did not change too much. In the former three decades mainly the years of Confucius and namely the 5th century BC have become the center of research as some majestic tombs have been found in the 1970ies. In those ancient days of Confucius a person was showing his state of social reputation and richness in musical instruments like bells and gongs belonging to his household. It is assumed to be sure that these musical ensembles consisiting of various instruments realy have been played and rarely just were used for representation purposes. Anyaway, if played or not, the instruments indicated the owner as to be highly respected, and this creates a relation to the instrument which is comparable to the relation between a Samurai and his sword. In many ethnicities of Asia we find the habit that people do not only own their personal instrument and never change it, they also get buried with their instruments so that noone else can play it after their death. In Southeast Asia, even today, owning a gong means you are highly respected and rich. The reason for this is not only that copper and bronze are still expensive today but also that using an instrument like this demands respect for the holy sounds it produces, the occasions where it is used within and of course the skills of playing this instrument in the appropriate way. Owning an instrument was a state of higher reputation, equal to the respect of the intellectual challenge to play. So which kind of instruments appear if we picture these associations? 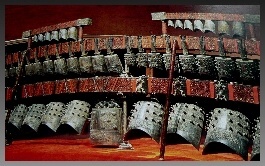 The most famous and amazing found of tombs from the 5th century BC (like the tomb of Marquis Zeng Hou Yi in Hubei Province) showed up with amazing sets of bell sets in various sizes hung up on stands. These bell sets ("Bian Zhong") are not surely declared in function, but it is clear that the first purpose was that of a musical instrument. Bell sets differ in apperance, but most of them show at least a range of three octaves, including all chromatic pitches of the temperized scale. This way, one might think of a bell set as a melodic one, but it is also possible that the bells were used in ensembles to give accents and represent the master tunig for other instruments. All bells found are still playable, and all of them hold carvings and scripts, which do not only indicate the two sounds a bell can produce, they even give playing advice and the first solmisation in music history, which is outstanding, as mostly all instruments in this time only hold dedications if carved. The first bell sets seem to go back to 12th century BC, the latter ones seem to require 5 players to be played, while it is still unclear whether the smaller bells which were hung nearly 3 meter above were played or not. 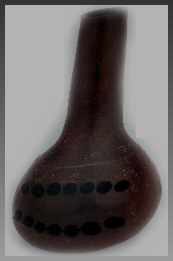 As with the bronze drums of the Dong Son culture in Vietnam we still have to be cautious with interpretations. Bells can be found worldwide, next to China we find bells in Persia very early, then followed by the signal giving hung bell in Christian churches. Worldwide, bells may be found as signal instruments used for cattle as for temple ceremonies, but only the Chinese bell sets surely function as a musical instrument, built with clearly defined pitches and carved with the two pitches and playing advices. Though the bells do not appear in the order we would nowadays expect them to, this is still another indication for the playing skills that were needed to be part of such a bell ensemble. It also seems as if the first set of bells found dating back to the 12th century BC were collected over the time and not produced at the same time. This diatonic set with bells collected from different ages and locations seemed to be the initial set for all following productions - this means, there was no “how to make a bell tuned C”, they just copied a bell further on for later bell sets, using it as the basic model for copies. This also is important for the historical impact of the bell tuning on other Chinese musical instruments. In the tombs unearthed and dated back to 5th century BC, we find another instrument that will be unique for countries allover East Asia, existing from Japan and Korea to Mongolia or even down to Vietnam: The zither. Zithers are understood as all instruments with strings stretching along a sideboard. Within the divers ancient zithers we do not only find disappeared models like the large 25-stringed Ze (left picture) or the long 5-stringed Zhu which maybe was struck instead of being plucked - we also find the 7-stringed Qin and the 21-stringed Zheng zithers which are still popular today and did not change from the first century AD until today. One is getting tuned by movable objects under the chord, like wooden pyramids used at the Zheng , the Japanese Koto or the Vietnamese Tranh, the other one uses tuning pegs at the end of the chord and has playing marks/frets like a guitar. Namely, the Qin was the first instrument ever using tuning pegs in the musical history of China. Even today the playing of the Qin represents the elegance and power of concentration in music, and a skilled Qin player is highly reputated. 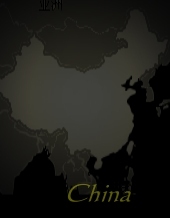 The sound of the Qin has become a worldwide trademark for “classical” China. During the Qin dynasty, while the interest in popular music was increasing, musicians were looking for a zither that was louder and more easy to transport. This is believed to be a reason for the development of the Zheng, which first appeared with 14 strings. 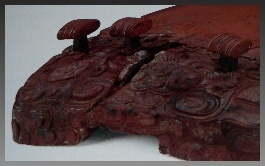 Both zithers, Qin and Zheng, were undergoing some changes, even the Qin was known with 10 string instead of 7, but after the first century no majestic changes were applied anymore, and the instruments, which were already widespread all over China at this time, did not change until today. This makes both instruments one of the oldest instruments worldwide which are still in use. For more informations about zithers, please read the Qin pages and check out the articles section. "Start with metal and stone, move along with silk and bamboo” - these words of the Zhou Yu in the second chapter of Guo Yu from the 4th century BC give a nice summarize for the ensemble practise used during the Confucian ages. Following this statement we clearly see a special role for wind instruments in the ancient ensemble, as these were the only ones that were able to produce remaining sounds. Compared to the metal bells and stone chimes and even to the plucked silk strings of the zithers, only the wind instruments give steady sounds that do not disappear within a second after being played. The ancient wind instruments may be seperated in three groups, consisting of transverse flutes, panpipes and the mouthorgan Sheng. Wind instruments and zithers were the first instruments which became available for the common citizen, while drums,chime stones and bell sets remained for the upper class as a symbol of reputation and richness. Wind instruments had to challenge the task to be equally tuned with the chime stones and bell sets who had a fixed tuning. The traverse flute represents a missing link between the old bone flute from the stone ages and the modern Chinese flute Dizi. It is one of the oldest, most simple and most popular instruments in China. The ancient panpipes Xiao reflect a musical transition beyond historical or geographical borders. This musical instrument which can be found all over the world appeared in China in the 6th century BC and it is believed that it first was used for hunting birds (which is still questionable). It later became the key instrument of the military music gu chui of the Han period. Another outstanding instrument still used until today is the mouthorgan Sheng which we also know with the names Khen in Laos or Sho in Japan. Mouthorgans like these also exist in various simple forms among the ethnicities of Southeast Asia. It remains unresearched whether the early mouthorgans were functionable instruments or just grave gifts. Today, mouthorgans were excavated ranging from six up to more than 50 pipes. it even turned it into a religion with temples and lithurgical rituals that demanded for the old ritual music again, even if it had to be renewed. Today, the ritual music is mainly lost, only parts of it survived in Taiwan or Korea. The importance of the old traditional ritual music is still present for much of Chinas musical attitude until today. It was in the early ages until 9th century BC that most ensembles had their main focus on percussive elements, since this importance of the timbre was shifted to concerns about pitch and tuning. There was following a more frequently use of melodic instruments like wind and string instruments. The chime stones and huge bell sets might be understood as a link between percussive and melodic instruments. Bells were able to be used both ways, even if the pitches were not really precise and it was hard for other instruments to assemble the tuning. As the ensembles changed, so did the music. We can assume that the ritual music reflected more and more content of traditional folk and entertaining music. On the other hand, the ritual music always tried to seperate from the entertaining music and appear as to be more intelligent, educated and of higher skills. These opposite intentions had a serious impact on the development of the traditional ritual music, as it was giving birth to several musical art forms like, for example, the intimacy and intelectuality of Qin playing. The biggest importance for the actual music of China lies in the possibility to look back through two thousand years of musical history - and see that even the most powerful aspects of the basic Chinese ritual music was already there. It was the germ-cell for the later chamber and court music as like those survived until today. Why do we find two melodic scales in the pitches of the ancient instruments if only one was used? The bell sets for example seem to be approximately chromatically tuned, but it is verified that they were playd pentatonically in spite. So, why have there been pitches which did not function by resounding in music? We can speculate that these tones only represented ideas of completement in a cosmological sense. On the other hand, different pitches mean the possibility to play pentatonic scales in several tonalities, and this already foreshadows the development of movable bridges under the chords of the Guzheng zither, providing more freedom in tune and for single pitches. We do also already find a lack of polyphonie or counterpoint in the ancient ritual music, which still matches the classical music of China today. Most of the instruments tried playing unisono, if split in octaves or not. Only few instruments may have intercoursed with ornamentations, and the variety of this music was created by changing the groups of playing instruments. There is no engagement for harmonical shiftings like in the Western major/minor system. Rhythm and tempo of the music remain unsure, but it might be speculated that the music was very slow. Even more important for our actual research is the existenz of written down textes and musical theory, starting from the Tang dynasty. Here we already discover that there is no notation for rhythmical elements, but all other aspects of playing the right tone in the right manner are given. If we now assume that rhythm was not important enough to be written down, we might oversee correlations in different meanings for significant symbols which were used for transcription. All these facts may be summarized in a dialectic way to involve theoretical aspects into ancient Chinese music: On one hand we do face a cosmological and mythological aspect of music, where pitches and tunes stand for celestial and divine relations to human life. On the other hand, the inscriptions of the early bell sets and writings of musical theory and notation later on show that there were several differencies, whether a written down theory of music was able to be applied so that the music was percieved as “correct”, or if the music was just played to be “enjoyable”. This, partially, may still be transmitted as a problem of traditional Chinese music today: If the traditional music is played “correctly”, mainly the ritual music of ceremonies, many people, many Chinese also, experience it as “boring”, even if this does not match the living celestial music as it was performed in the ancient days.